Do you know how to tell when someone is lying to you? I wrote "How to Tell If Someone is Lying" because I was tired of wondering whether my family members and coworkers were really being honest with me. I hated being dubbed the 'gullible' person in my network of contacts, so made the discovery of truth-telling my obsession, and this book is the result of my studies and non-scientific experimenting in my personal life. When somebody is lying to you, that person gives off certain signals that you can detect (if you know what to look for) no matter how good of a liar that person may be. Lying goes against a person's code of ethics, whatever the reason for it, and just as in poker, every liar has a 'tell'. 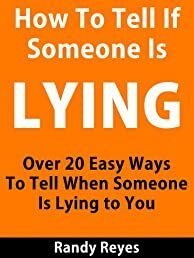 I give away over 20 easy methods you can use to detect a liar - so you won't ever fall into the trap of being 'duped' very easily ever again. Whether it be employees, children, or even a cheating spouse that has you worried, this book will arm you with truth-finding tools you can ethically use to root out the lies in your life and find the freedom that comes from knowing who you can trust. - What Is a Lie, and How Do You Recognize One When You See It? - What's The History Of Lie Detection? - How Do Relationships Factor Into Lying? - How Does Lying Work, Psychologically Speaking? - How Can You Tell If Someone Is Lying To You? - Why Is It Important To Practice Truth-Finding? - What Are Some Examples Of Uncovering A Liar? - How Does This Apply To You? Read "How To Tell If Someone Is Lying" and you won't be fooled again.